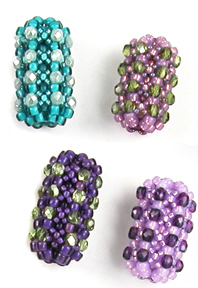 For a limited time I’m giving away free instructions for making SaraBeth Cullinan’s Dolphino Beaded Beads when you purchase the Spring/Summer 2011 Color Report. (Upon purchase you’ll receive a link to download the free PDF instructions). You won’t want to miss this opportunity to receive anything free from SaraBeth. 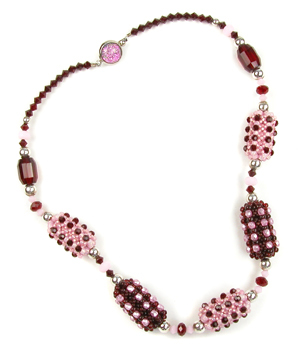 Her designs and instructions have appeared in Beadwork and Bead & Button, Creative Jewelry and Stringing magazines. Her beautiful color choices and designs are in all of my Color Reports and both of my color books, The Beader’s Color Palette, and The Beader’s Guide to Color. Check out the Color Report, and learn all about the colors of this season: what sells and what designers are using. And get great ideas about how to use them. Is there a way to purchase the pattern for the Dolphino Beads now that the April 15 deadline has passed? Thank you…I would really like to make these beads. Please reply to my email address. I’ve forwarded your request to SaraBeth Cullinan, the creator of the Dolphino Beads. Thank you!